Unlike toaster ovens, toasters have one purpose and one purpose only: to make toast just the way you like it. Offering a compact solutions for homes that already have ovens, they are a must-have kitchen item. With a variety of size options for big or small families and a variety of finishes and styles to suit any taste, the perfect toaster is waiting for you. 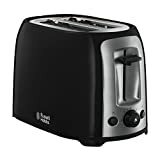 To help you find it, we have put together this toaster shopping guide with all the information you need to make a smart choice, quickly. 2 Slice Toasters: These are toasters that can hold up to two slices of toast at time. This makes them smaller and more affordable and they are an ideal choice for couples and small families or people who don’t eat toast as frequently. 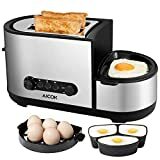 4 Slice Toasters: Four slice toasters can toast up to four slices of toast in one go and often include added features for added convenience. 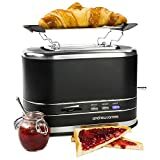 They are a great appliance for medium to large families making breakfast time efficient and easy, or for people who love to eat a lot of toast. Chrome Toasters: These shiny toasters make a flashy addition to any kitchen. Offering a shiny fashionable finish, they are a popular choice for many consumers. Plastic Toasters: With a host of affordable and style options, plastic toasters are available in a variety of colors that make it easier to fit into your current kitchen decor and style. 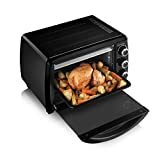 Stainless Steel Toasters: Stainless steel toasters are the most durable toasters and their resistance to dirt make them easier to clean and a popular toaster investment. Dual Finish Toasters: With the durability of steel and the colour compatibility of plastic, dual finish toasters are a great combination between longevity and style. Operation: Toasters that are easy and simple to use review much better than ones that aren't. This goes for cleaning as well; stainless steel toasters generally are the easiest to clean. 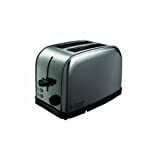 Features: Two top ranking toaster features are reheat buttons and a toast-from-frozen function. Toasters with these features result in many more satisfied owners. Another mentioned feature is leverless operation that allows consumers effortless and functional toasting. Consider the size of your storage or your counter space before making a final decision. For less storage and counter space, 2 slice toasters are more conveniently compact. Quality toasters come with warranties of up to three years for added peace of mind and longevity. For more variety in the types of breads you can toast, look for a toaster that offers wider slots. This will make it possible to toast anything from white slices and english muffins to family baked breads. 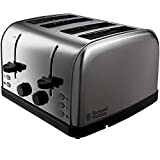 A basic, good quality toaster should include a few minimum settings - a shade dial setting that allows you to adjust how toasted you want your toast and a cancel button to simply stop the toasting at any time. Some added settings to consider when choosing your toaster are: Bagel settings will allow you to toast one side of the bagel and warm the other. Defrost settings will allow you to toast bread that is still frozen. A high carriage bread lifter will make it possible for you to toast smaller pieces of bread without any hassle in removing it. A crumb tray will collect all the toast crumbs and make cleaning much easier. Retractable cords on toasters allow for easier cord storage. Auto centering is a feature that makes sure the bread is evenly toasted. And reheat settings allow you to reheat toast without over toasting it. Some toasters come with an included toaster cover, making sure your toaster stays clean and protected in between uses. If you toaster doesn’t come with one, they are sold separately in a variety of styles and colors. Another add accessory is toaster tongs, helping prevent finger burn when taking out hot toast. Some higher end toasters will included digital control panels with more exact programs and LED features that light up to let you know what settings your toaster is on. A safety feature to consider when buying your new toaster is cool to touch surfacing that will ensure no matter how much toast you have made, the appliance will not overheat causing finger burn. 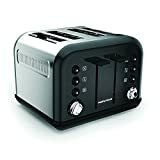 Hamilton: Famous for manufacturing quality home appliances and good customer service, Hamilton supply quality toasters and other kitchenware in a variety of styles. West Bend: West Bend specializes in electric kitchen appliances and has been in business for over 100 years. Whether you are looking to toast or blend, they have the product you need. Breville: Inventing the first sandwich toaster in the 1980’s, Breville has become known by consumers for their quality kitchen appliances. They specialize in kettles, toasters, irons, blenders, food processors, juicers, and more. Cuisinart: Cuisinart has won numerous awards for their appliance designs and matches modern technology with traditional appliances to bring innovative products. As a name synonymous with quality, their toasters are a good quality choice.